Ischnoderma resinosum JerkyBy Jerry Sapp Jr.Ischnoderma resinosum is not frequently picked but the flesh on young specimens is soft and meaty. In this recipe the mushroom is dried into jerky strips for enjoyment over the winter months. Smoked chicken of the woodsBy Scott PavelleThis is Scott’s favorite use of chicken mushrooms. It is the closest you’ll ever come to a true veggie bacon and has been described as “spot on” by chef Steve Eldridge of Pittsburgh's _Provision_ restaurant, a genuine master of the art. We use it as an ingredient in just about any dish where you’d otherwise like a hit of bacon. Pastas, salads, vegetables, sandwiches, you name it. The texture is like chicken that’s been very gently poached. 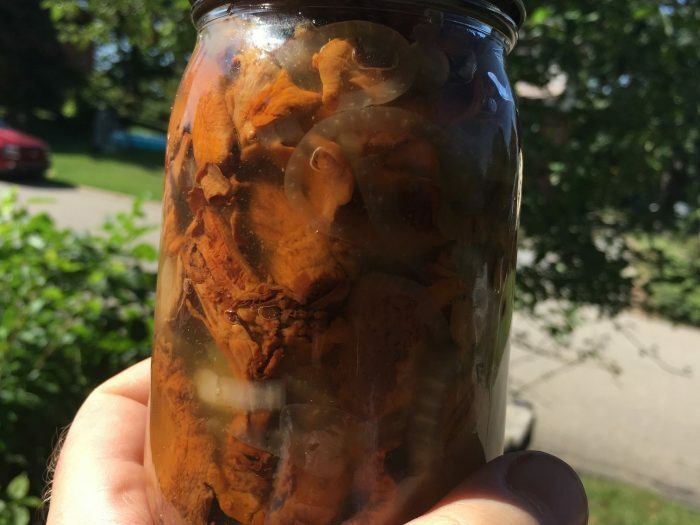 Pickled ChanterellesBy Scott PavelleSince people asked, here is the recipe we used to make the Pickled Chanterelles served at the 2018 Lincoff foray. You can obviously cut it in half if that is more convenient. 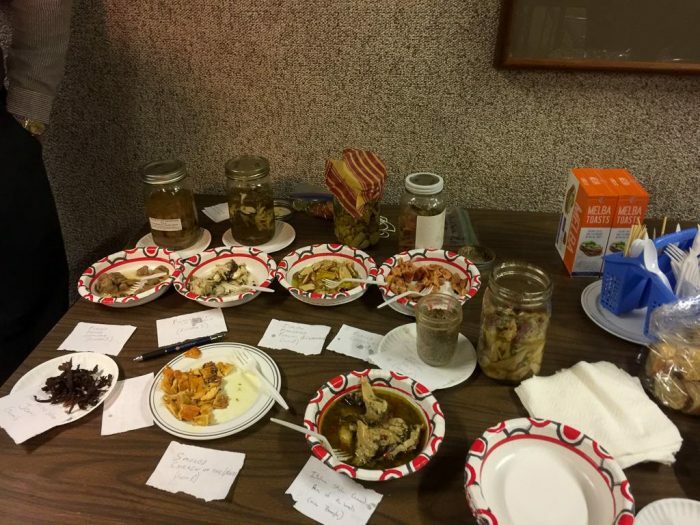 This is the recipe used at the 2018 Lincoff Foray. It is adapted from a recipe provided by Mary Smiley, who now lives in Maryland (a different woman from Pittsburgh’s own Mary Jo Smiley). Pickled Chanterelles NOTE: The original recipe specified white wine vinegar but we used what we had handy. We believe that 100% champagne vinegar would have been even better, but the key is to avoid a harsh one. We also added the onions (for complexity and because we love pickled onions anyway) and the star anise (because it plays so nicely with chanterelles). One recipe makes ≈ 4-5 quarts of chanterelle pickle. GENERAL OBSERVATIONS: Vinegar-based pickles like these typically follow a 3 step process: (A) Boil briefly to get rid of the spores and impurities, (B) Jar with something like a 1:2 mixture of vinegar-to-water, and then (C) Finish cooking in the jars for 30 minutes, which will create a vacuum seal for long term storage. This recipe is slightly unusual because the parboiling step takes place in the brine. That makes them ready to eat right away and allows you to ignore the vacuum-sealing step if you’re keeping them in the fridge for a maximum of 60 days. We do the whole process because we store them in the pantry indefinitely. Just remember that the jars will be prettier if you leave behind the dusty impurities as you move the liquid into your jars. SAFETY NOTE: As always, if the lid pops during storage you should throw the whole thing away because something went badly wrong. Honey mushroom pierogiesBy Richard JacobHere is a great autumn dish with lots of Pittsburgh flair - honey mushroom pierogies. Now for those that don't know me I am not from Pittsburgh and I don't have an Eastern European background which means I won't be making the pierogies the same way as your Mother/Grandmother/Babcia . So take my recipe for pierogi dough with a pinch of salt, if you have a different/better recipe please feel free to use that. For those that don't have a pierogi dough recipe this one should work just fine. 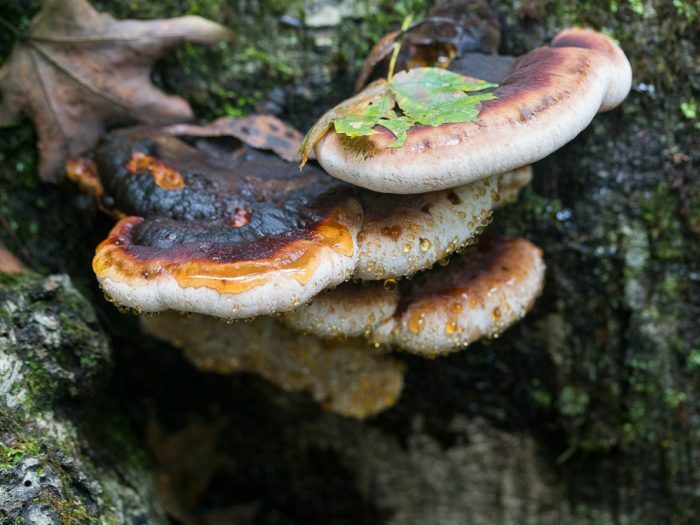 Honey mushrooms are named after their color rather than their taste. They can have a bit of a livery taste and if this is the first time eating honey mushrooms try the cream cheese variation first. 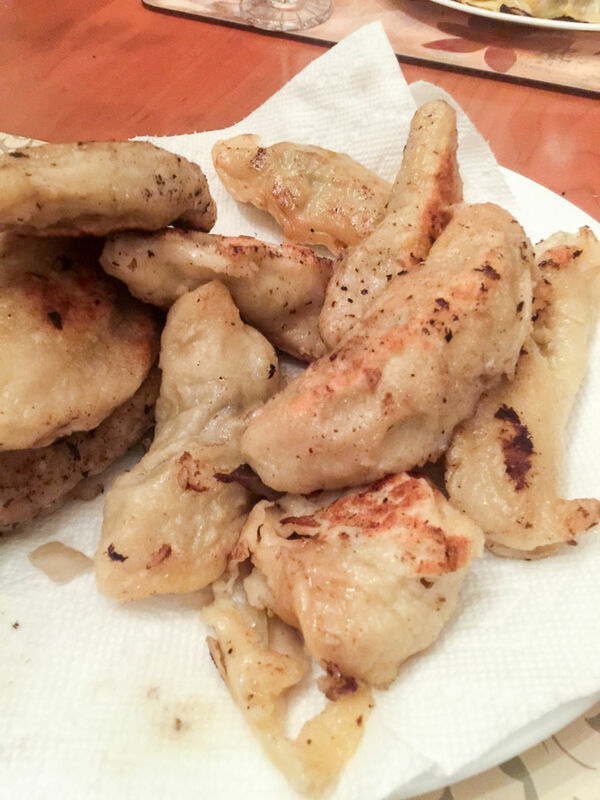 I recommend cooking the Honey mushrooms quite well in order to bring out the flavor and avoid any adverse reactions that are occasionally reported when they are under cooked. You can of course use any mushrooms, wild or store brought, or a mixture of mushrooms for this recipe. Button mushrooms and Shiitake would both work well. 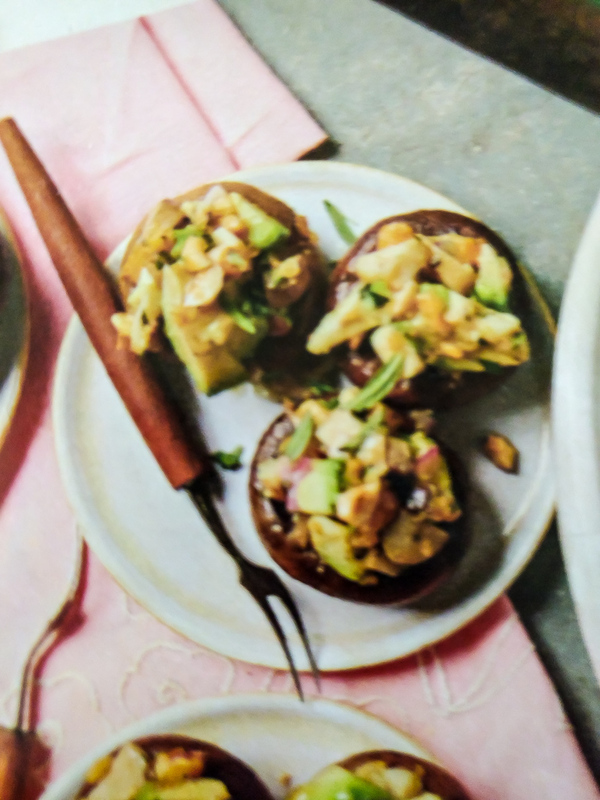 Avocado stuffed mushroomsBy Patricia HouckHere is a quick and easy appetizer using the ever popular Avocado. 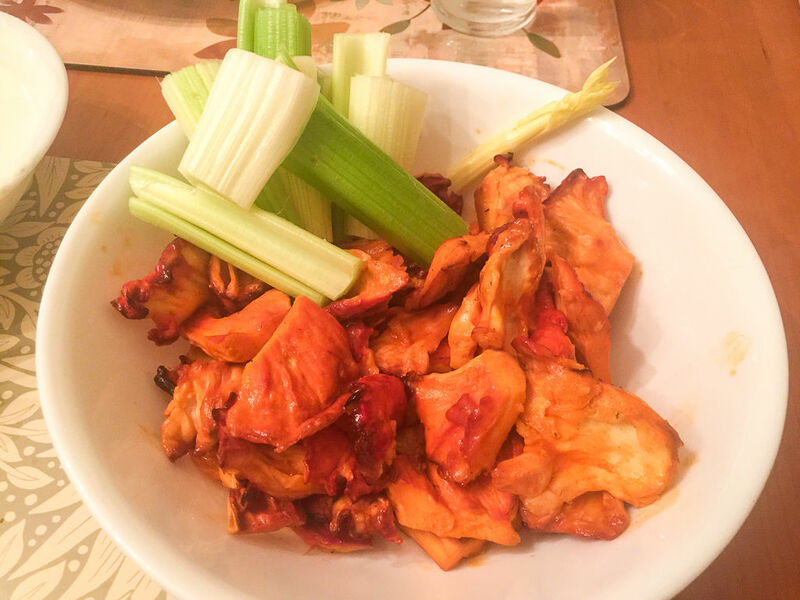 Buffalo chicken of the woods and blue cheese dipBy Richard JacobI had recently found some nice young and fresh chicken of the woods and was looking for an appetizer recipe rather then the more traditional main courses and came across this Buffalo chicken of the woods recipe. After trying it I had to share. I have adapted the original recipe by The Foraged Foodie. Chicken of the woods (Laetiporus sulphureus or Laetiporus cincinnatus) has a great texture that is very similar to cooked chicken. You need young chicken of the woods for the best texture when cooking. If it is too old it either becomes very hard and woody or worse, mealy. Finding young and fresh chicken of the woods is a lot rarer than you think. If you do find a nice fruiting and have some spare it is easy to store. Clean the shelfs and cut the really woody parts off then vacuum pack if you can and freeze. The blue cheese sauce and celery sticks are optional but why not go all with this fabulous appetizer? No one will complain if you use bottle ranch or blue cheese dressing. 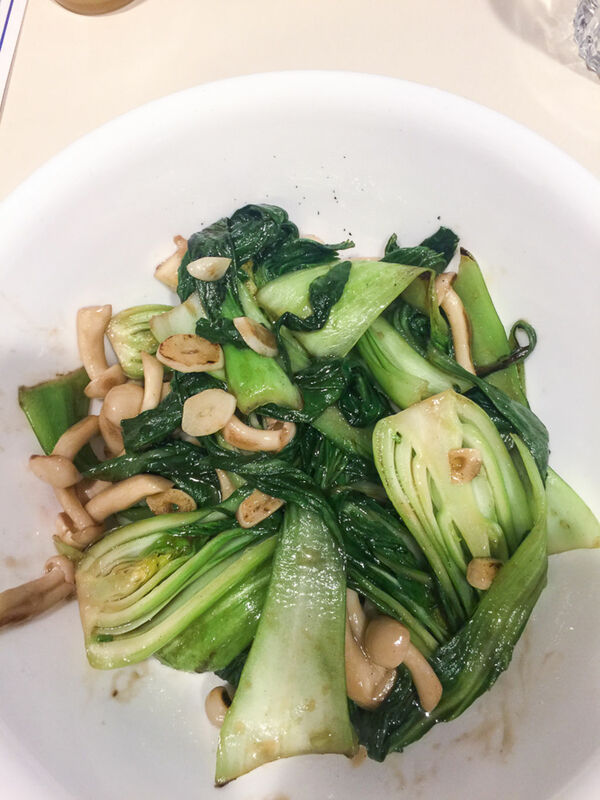 Asian greens with mushroomsBy Richard JacobThere are lots of ways to cook this Asian staple including steaming, boiling or microwaving the greens. Here I do a quick stir fry followed by steam/braise. Serve the dish with rice and other Chinese or Asian dishes. This dish was presented as part of the cooking demonstration at the September 2016 meeting. Grilled MorelsBy Richard JacobSpring has normally sprung when the morels are up and temperatures are warm enough to fire up the grill. 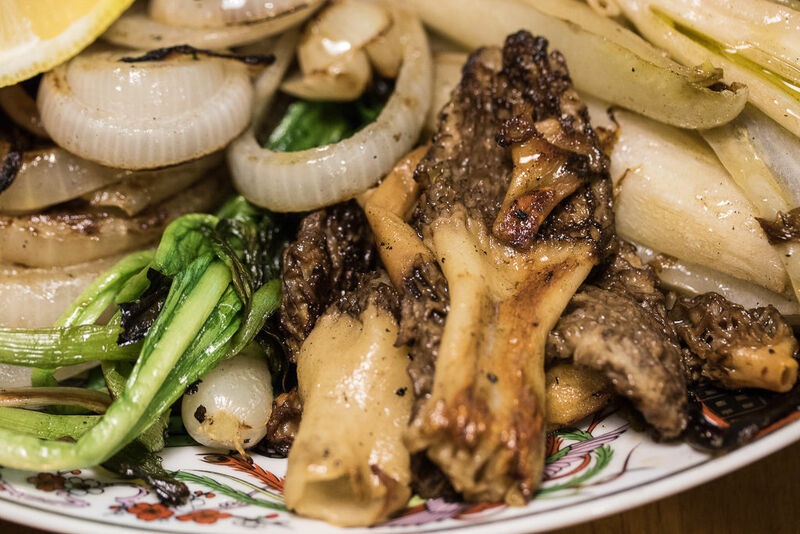 Grilling adds a little smokiness to the morels and the butter, rather than oil, imparts a richness with both combining to make a tasty side dish. The high heat helps caramelize the morels bringing out the meaty flavor. I recommend using a grilling basket because it is a tragedy to see a morel slip between the bars and fall into the coals. Try serving the mushrooms as part of a Santa Margherita style Italian Grilled Vegetable platter as pictured or as a topping for a steak or burger. 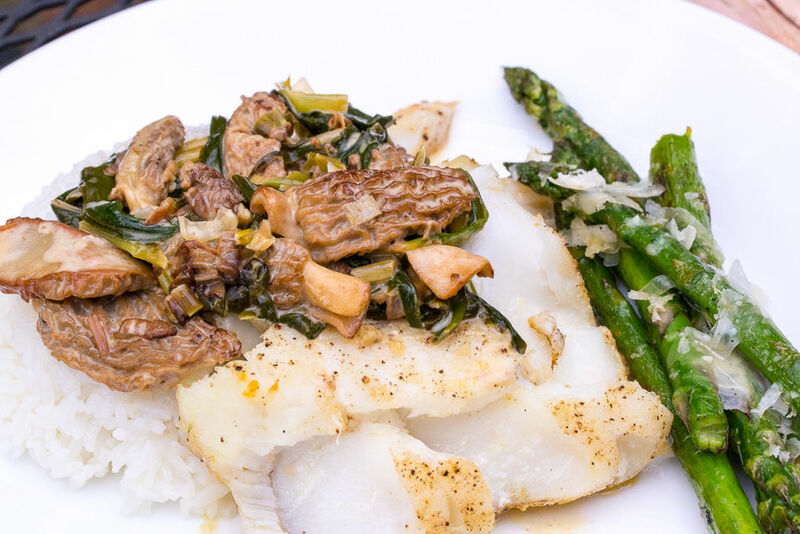 Fish with morel and ramp cream sauceBy Richard JacobCombine these two popular spring ingredients, Morels and Ramps, in a cream sauce to make a delicious supper.